In Water Panic, you guide a girl floating on an inner tube through a series of perilous areas. Rather than the normal dangers associated with tubing, you face giant creatures that want to crush you, enormous whirlpools, and sports balls the size of houses. To leave each area, you must collect a varying number of keys before you run out of time. You can collect fruit and other items scattered around the area to gain time, and being crushed by a monster or other large object significantly reduces your remaining time. Some of the items you collect also have other effects, positive and negative. The graphics in Water Panic are bright and colorful. Everything looks nice, but some things don't quite seem to fit together graphically. This sort of thing usually bothers me but in this case, strangely, I think that it actually gives the game some of its charm. The look of the game combined with the polished basic gameplay and catchy music make it a lot of fun to play. I also get the impression that BorisE had a lot of fun working on the game. As fun as it is, though, the game is pretty challenging. Being cornered by a monster or two can mean game over regardless of how well you've done in earlier areas. But the difficulty is not unreasonable. You'll find yourself improving once you learn the level layouts and develop some dodging tactics. For me, this game has that elusive element that makes you want to keep trying even when things get frustrating. Water Panic just has a fun aura about it that's hard to tie to concrete aspects of the game. You paddle your innertube round a series of giant pools collecting stuff like fruit, bonuses and keys to complete the level while avoiding the huge round monsters. Recommendations: The 4 people who like Water Panic also like the following games. For what its worth I still intend to go back to gamemaker, even if just to port stuff to GM V8 and get it on the yoyogames site. I don't know why I had never played this until now. I really like the fog horn. There is the source for an earlier version at http://www.boristheengineer.co.uk/gamemaker/waterpanic.htm (at the bottom of the page). Is it possible to get the source code for this game? or maybe something similar? This game is AWSOME. And its the most insane game i�we ever played. 0.o Congrats!! Not many games are so psycotic-twisted than this one. Its almost japanese. (with permission). It might have been used in another game, I don't know. The balls with eyes just sort of happened, I wanted a monster with a round collision zone to keep it simple so I started with a plain circle with eyes to give it direction. Later I found a shiny ball image and I added the eyes. I think it might be slightly inspired by the bowling ball boss in the 'Simpsons' arcade game. Did you use music from the game Gubble in this? it really really sounds like it. pretty good job btu what where those giants shiny balls with eyes? Great graphics and gameplay, this is in my favorites list. This is awesome!!! I couldn't have made anything remotely as good as this. This game is nice, I'd reccommend this to be in an arcade!!! Author's comment: Yep that's supposed to be a girl, wearing a bikini. Ww-wow!!! This game is a certain shocker! I kept getting squished, though... and that time limit.. oh, well. I guess I'm just unskilled! 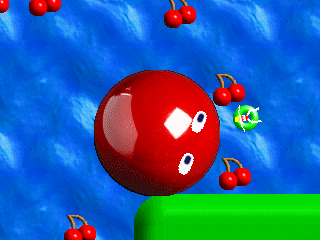 Pretty unique concept, a little guy in a rubber dinghy, constantly being pursued by giant balls... with EYES! Aaahhhh! Welp, pretty good, mon. Hope to see more from you. I really enjoyed this. The no-frills life bar could use some improvement, but that's a tiny issue. Definitely a game worth trying. Ohh, this game is exellent, great gameplay, music and Its very original!